Another day of sunshine and another day outdoors. This morning the kids spent a lot of time playing “Star Wars”, which seemed to involve them running around pretending to be various different characters, visiting different planets in the Galaxy. Jasmine even drew a map on a piece of paper so they knew where they were going! After running around the house a few times, they moved into the garden and continued the game outside. When “Star Wars” had ended they came asking for something else to do so I suggested we start painting some of the rocks we collected from the beach last week. I gave them gold, green and pink paint (gold because Jasmine asked for it and green and pink because they were on the top of the paint box!) 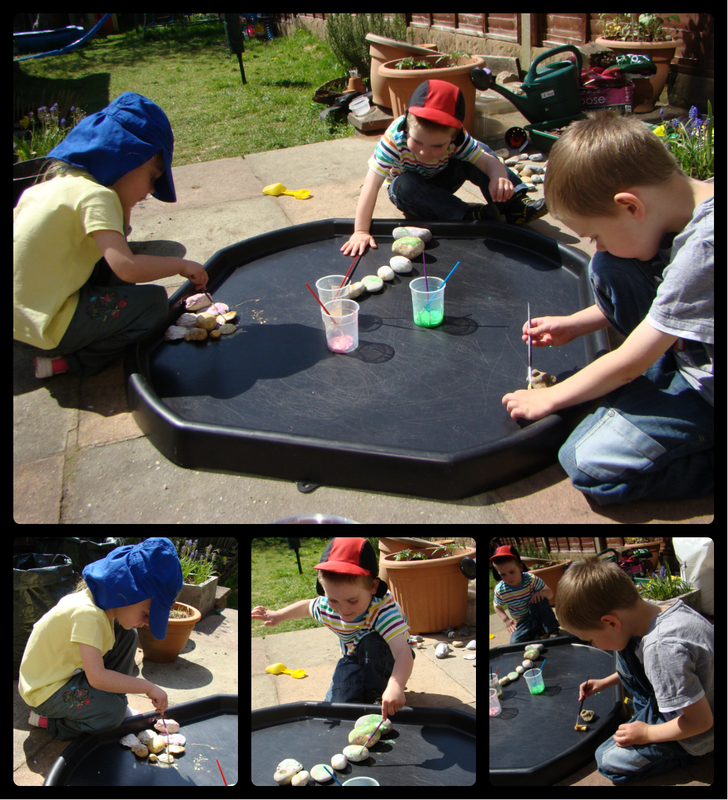 and they choose the rocks they wanted and started painting. The rock painting will be an ongoing project I think! This afternoon we met up with some other home educating families in a local park. The kids had a great time playing with their friends while us adults chatted (or tried to while keeping half an eye on the small ones!) One of the mums had brought along some bubbles so she was centre of attention for quite a long time! Bubbles are a definite winner every time! Jasmine also managed to fit in some bug hunting while we were there. She found a beetle, lots of ants and an earwig. The earwig was very exciting because it is the first one she had caught this year! Then it was back to Caterpillar Tales house for a quick pizza dinner before the girls headed off to Rainbows again. It has been another busy Wednesday, but we had a really nice time in the park and Jasmine is loving Rainbows so (apart from one major meltdown from Ben when he suddenly realised he was hot, tired and hungry after leaving the park) it has been a good day!